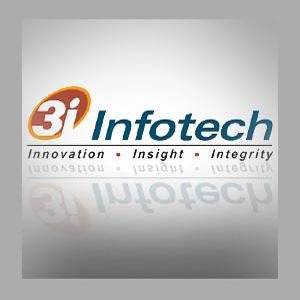 Technical analyst Hitesh Chotalia has maintained 'buy' rating on 3i Infotech Limited stock with a target of Rs 60. According to analyst, the investors can purchase the stock with a stop loss of 55. The stock of the company, on December 07, closed at Rs 56.50 on the Bombay Stock Exchange (BSE). The share price has seen a 52-week high of Rs 97.40 and a low of Rs 55.05 on BSE. Current EPS & P/E ratio stood at 14.56 and 3.88 respectively. 3i Infotech, a worldwide supplier of IT solutions, has announced an increase of 11.5% in its consolidated PAT, which stood at Rs 637.7 million over the corresponding quarter of 2009. For the period, the company's revenue remained 2.3% up at Rs 6.47 billion as compared to the corresponding quarter of the previous year. The company's earnings per share for the quarter under review stood at Rs 3.24 as compared to Rs 3.83 in the same period of last year. While commenting on the quarterly outcomes, V. Srinivasan, MD & global CEO, 3i Infotech stated, "While the developed markets continue to be sluggish for the segments the Company is operating in, the emerging markets are recording growth. Since 40% of the company`s business is from the emerging markets, any slowdown in the developed markets is likely to be absorbed by growth in the emerging markets."